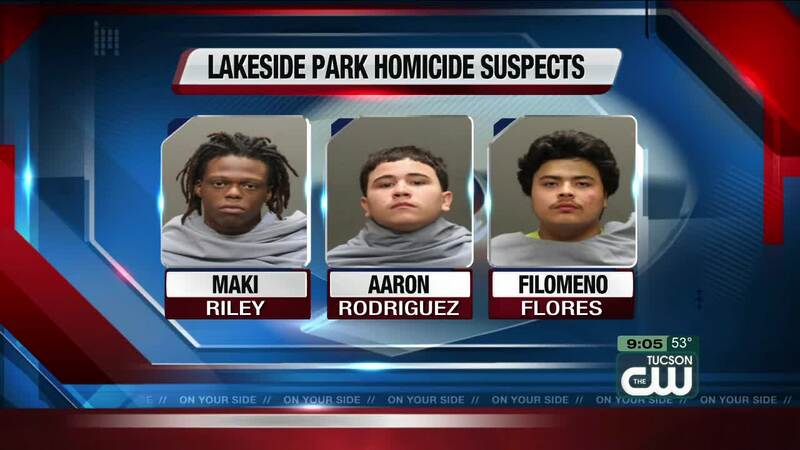 The Tucson Police Department has identified and arrested three suspects involved in last month's triple-homicide at Lakeside Park. TUCSON, Ariz. - The Tucson Police Department has identified and arrested three suspects involved in last month's triple-homicide at Lakeside Park. The suspects have been identified as 15-year-old Filomeno Edwardo Flores, 16-year-old Maki Dion Riley, and 16-year-old Aaron Rodriguez. All three were arrested without incident and have been charged with one count of first degree murder. TPD is continuing to investigate. On November 8, TPD responded to reports of a shooting at Lakeside Park. Upon arrival, officers found three males on the ground with gunshot trauma. The three victims, 21-year-old Matthew Favela, 16-year-old Carlos Ross, and 16-year-old Amonn Sandoval were all pronounced deceased. Detectives later learned that Favela and Ross and two friends drove to the park to meet with Sandoval and an unknown man. After a brief conversation between the groups, Favela, Ross and Sandoval were all struck by gunfire. TPD said the incident was not gang-related.